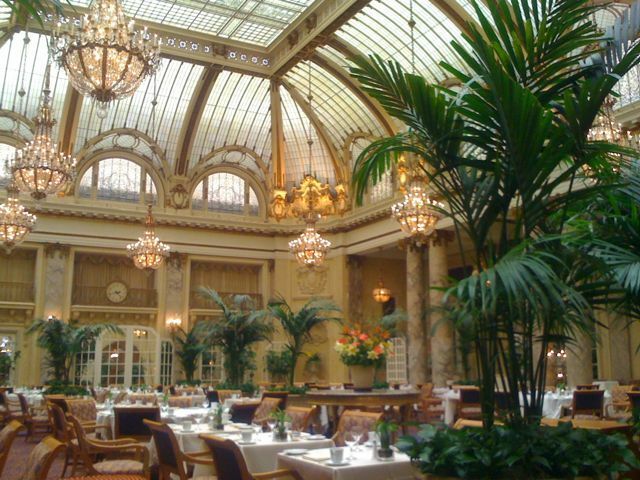 After an all day meeting in San Francisco on Wednesday I met art buddy Sonia for some sketching at the Palace Hotel’s Garden Court atrium. It’s a stunning and historical room but detail lover that I am, I chose one tiny spot across the room to draw and then spent an hour on it, while Sonia did 4 or 5 sketches. 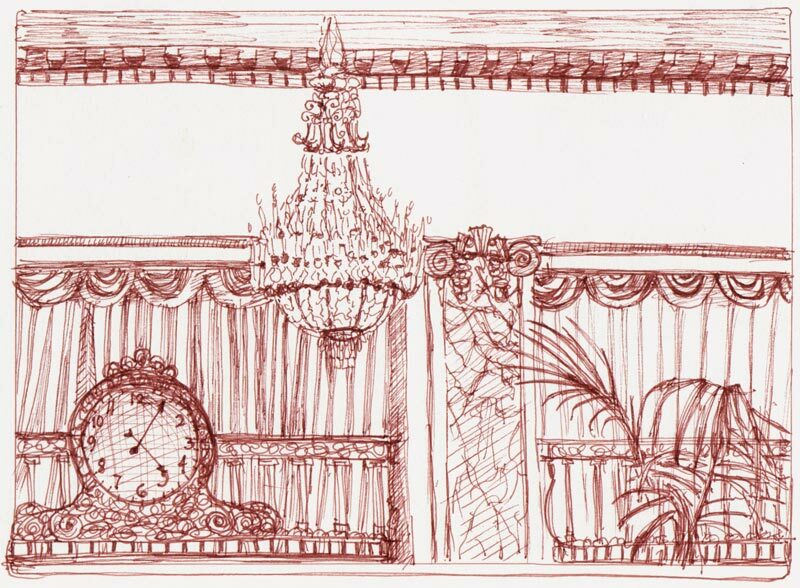 I started with the furthest chandelier and the clock on the wall and just kept discovering more and more fun things to draw. If we weren’t so hungry and tired we could have stayed there all night sketching. 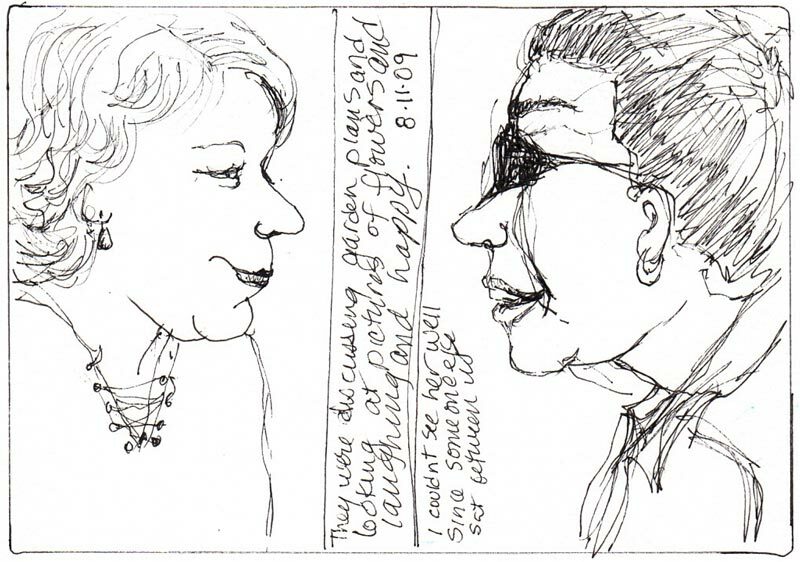 The first lady just slid right off my pen, perfectly drawn (as I saw her) but her friend kept moving and I couldn’t get close to a likeness. More commuter sketches (and one eagle who adorns the top of the Oakland City Hall). 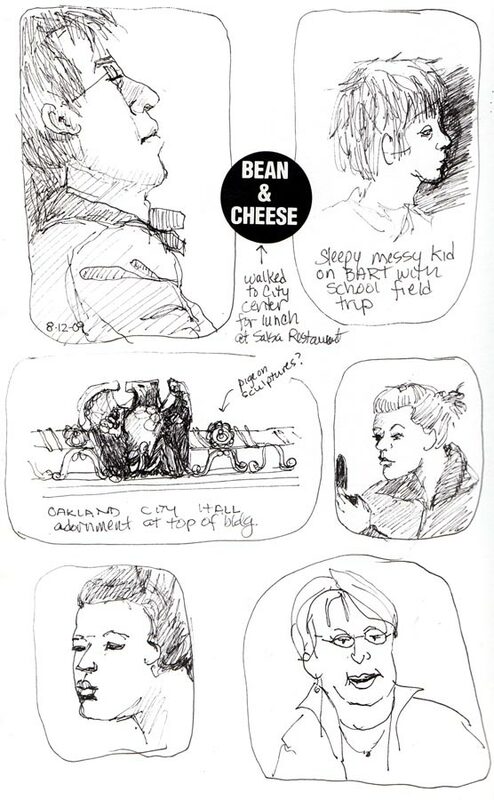 My co-workers and I took advantage of a sunny and surprisingly quiet day at the office to walk to Oakland City Center for lunch (ergo the Bean and Cheese sticker) and I even had a moment to pull out my sketchbook. That messy little boy top right was on a field trip but looked like he should have still been home in bed. And that’s where I should be too. It’s been a rocky week. Glad it’s over. Next Post: Rush Ranch, Plein Air: Lost Again!